So, what’s this all about then? Well, it’s the usual story – reconnecting with my youth. I owned an Amiga following a CBM-64 during my A-Levels and into University. 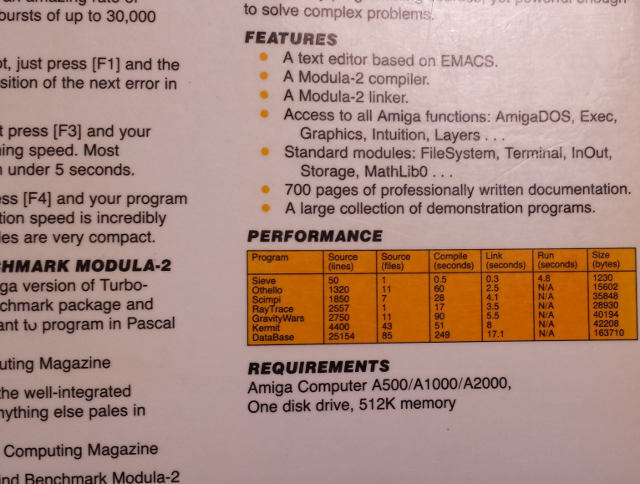 I used my Amiga to learn how to program in Modula-2 which was one of the set languages in my 2nd year at Uni. 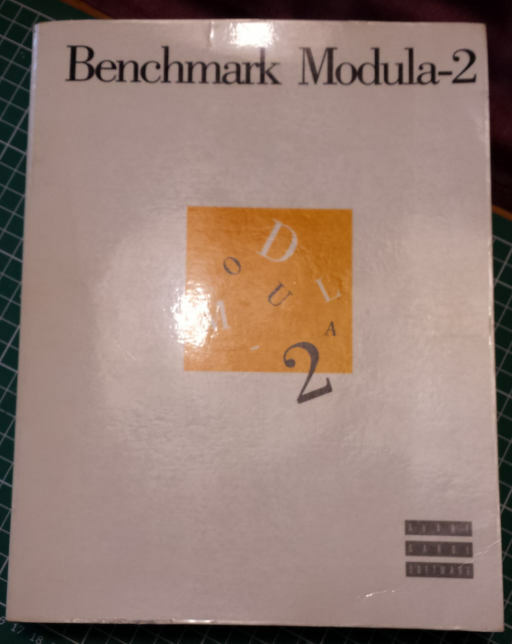 The version I chose was Benchmark Modula-2 by Avante-Garde Software. It came as a shrink wrapped 1,000-odd page manual and a couple of disks. I successfully used this on a two-floppy 512KB expanded Amiga 500. Detail of the back of the manual. I’m not joking, I must had read that 100 times over the years! During my 3rd year at Uni I ditched the Amiga in favour of a PC (first a twin-floppy Amstrad PPC-640 [some would say a distinct step backwards!] and then a Twinhead Desktop 8088 with a hard drive). At some point the Benchmark Modula-2 disks either became unreadable or got lost. The Amiga became very yellow and stopped working. In the intervening 22-ish years I kept the manual. In the past five or so years I have been actively looking for the software. This year, after some detective work, I managed to track down someone who had an ISO image of the compiler, editor, demo programs and source level debugger. Part of the deal was that I scanned the manual and made it available in PDF form. I scanned the entire manual by hand on a flat-bed scanner over about 3 long nights, and after a nervous wait was finally rewarded with a 5-ish MB ISO image. Several stalled attempts with WinUAE (copying Amiga files using Windows Explorer doesn’t work too well) I finally had the screen I had waited 20-some years to see again. M2Ed. 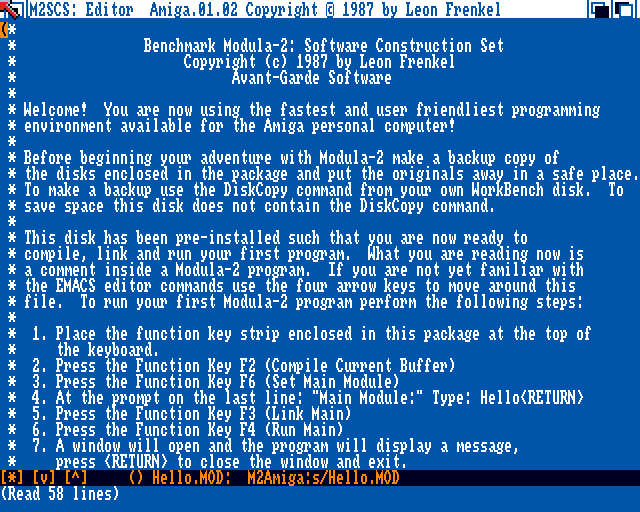 The startup screen for a freshly installed copy of Benchmark Modula-2. A Hello World program is waiting to be compiled, linked and run.